Age: 3 & Up Years Product Description: Our Betty Lukens Through the Bible in Felt English Deluxe Small Bible Sets illustrate Old and New Testament stories. The Small Set is recommended when teaching groups of less than 10 people. This set comes ready for you to cut out. 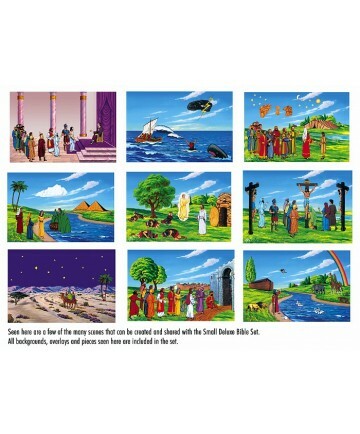 The Small Deluxe Set includes: - 600 6-1/2" figures and objects: Includes 12 figures of Jesus plus men, women, children, animals, buildings, scenery items, tables, chairs, pyramids, tomb, ark, fiery furnace, and many, many more. All pieces come on large sheets of felt ready for you to cut and place into your file system included in this set. 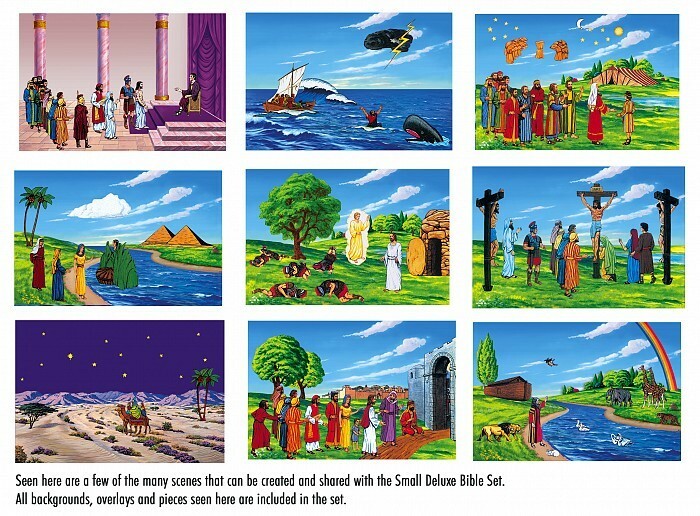 - 3 mounted backgrounds (16" x 24") - Water and Sky, Indoor and Purple - 4 bright and colorful overlays - Hillside, Shoreline, Desert and Throne Room - Teachers Manual with 182 stories in English - 1 Box filing system for storing all 600 pieces This is our most complete collection of figures, backgrounds and overlays. It will capture the attention of even the most active children. Great for preschoolers and Sunday School!